Black and white may be a timeless palette for wardrobes, but it can be a little tricky to pull off in decor. Choose the wrong elements and you’ll have a look that's unintentionally kitschy. This is very true for the kitchen, where the wrong scale of black-and-white floor tile can create a 1950s-themed diner effect. Black appliances may be trendy right now but can skew '80s if they have a shiny finish—especially when paired with matte white counters and cabinets. 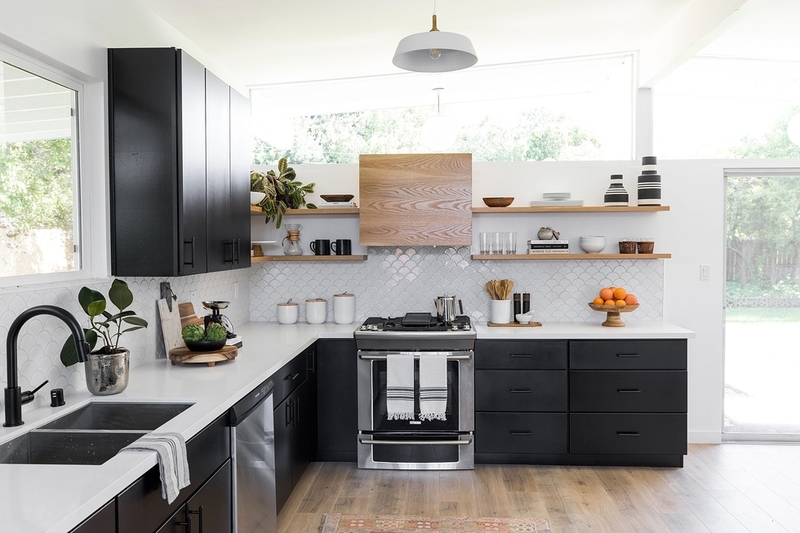 To master the look in a new way, take a look at these six black-and-white kitchens that range from traditional to modern. White counters continue to dominate, making black countertops a more unexpected choice. 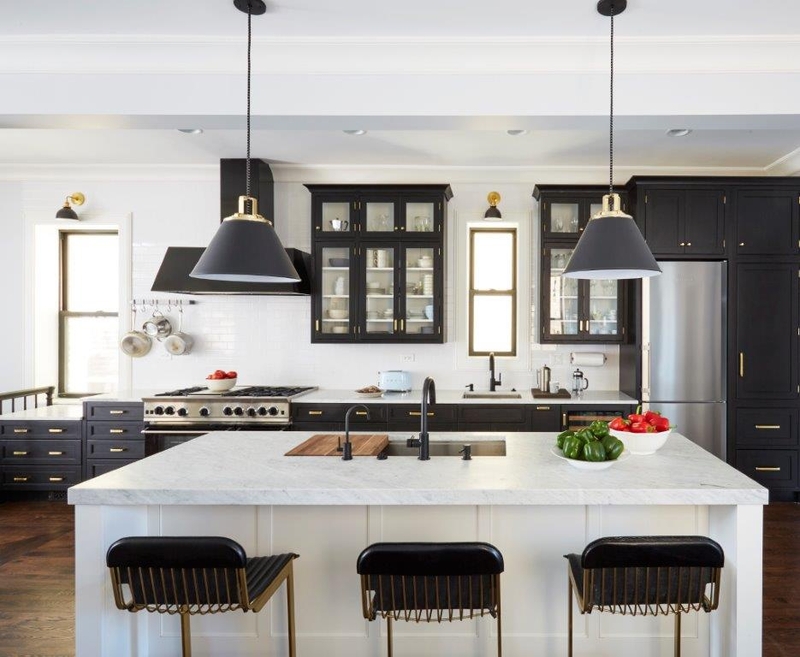 In this kitchen by Design Storms, the dark surface picks up the black hardware and matte black backsplash for effortless contrast. 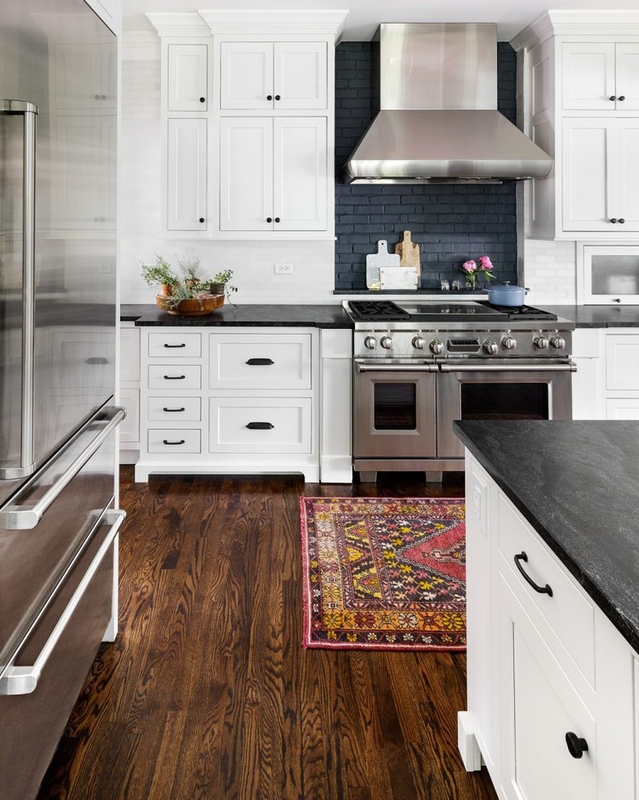 The cabinets and counters do lean towards a traditional look, but the throw rug and the aforementioned matte black backsplash add a slight boho edge. In another black-and-white kitchen, Design Storms takes the palette in a direction that trends towards the farmhouse look. 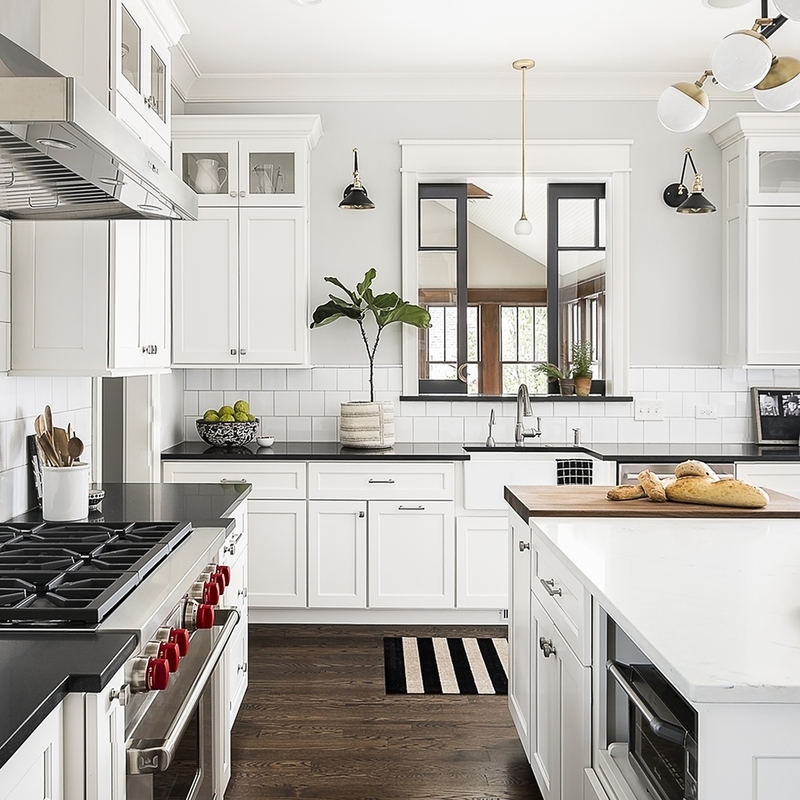 Tailored cabinets, a deep farmhouse sink, large square tiles, and elegant moldings get a modern update through the gleaming black countertops. 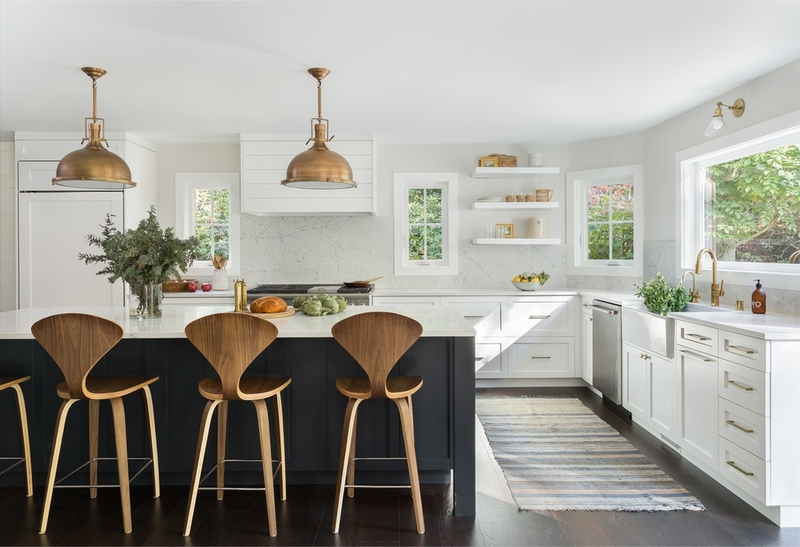 This kitchen by Rebekah Zaveloff Interiors/KitchenLab would also appeal to those who want that mix of modern and traditional elements, with a bit more drama. The black cabinetry feels like a bold choice, but the white island, counters, and tile maximize light to keep the look from getting too dark. 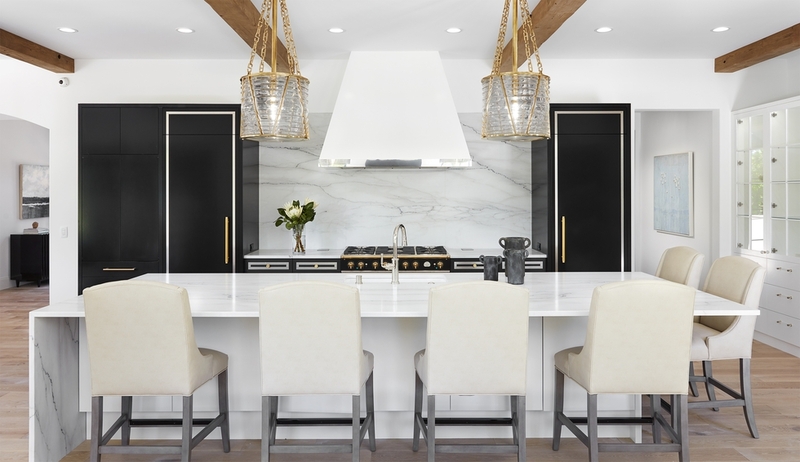 Black cabinetry takes on a more glamorous feel in this design by Robb Whittlef and Sharon Seitz and HISTORIC studio, in collaboration on a new construction home with Ron Brenner Architects and custom builder Hage Homes. In this case, it’s the shining finish, clean lines, and spare touches of brass on the cabinets that convey a more luxe look. Of course, the expanses of white marble and glimmering pendants also amp up the glamour factor. Black and white can easily go contemporary, like in this project by Design Shop Interiors. Here, the effect is achieved by keeping the lines as sleek as possible. Interestingly, instead of adding contrast through cabinet hardware, the design incorporates a natural wood cabinet and open shelves for that unexpected element. A little contemporary, traditional, and vintage, this eclectic kitchen by Heidi Callier Design brings together a variety of influences. The way it can all coexist? By focusing mainly on white, then adding a bit of black (on the base of the kitchen island) for contrast. The black backdrop also allows the unique shape of the stools to stand out even more for a statement look.